On Saturday, March 24th, as I stood among the diverse crowd in Washington, D.C., listening to the inspiring speeches of countless youth leaders, I knew I was witnessing a unique moment of history. Too often, young people are viewed as passive bystanders who don’t understand the reality of the world they live in, but these speakers, 20 years of age or younger, showed that isn’t true. They stirred the multi-generational crowd in the nation’s capital with intelligence, conviction, and eloquence. Making their voices heard, they stood tall in their belief that the world can, and should, be different. In the positive youth development sphere, the power that youth possess is often referred to as youth agency. Defining exactly what this word means can be tricky, but what’s important to remember is that despite living in a world where their voices often go unheard and unheeded, young people don’t lack agency. What they lack, and what youth-serving agencies should strive to provide, are the opportunities, resources, and support that young people need to discover, unlock, and operationalize a potential that is already present. Though the March for Our Lives message was directed in large part to leaders and lawmakers, it reminded me why I was so passionate about joining the International Youth Foundation, which has focused on positive youth development for almost 30 years. Much has been written in the last few weeks about the poise, civic-mindedness, and eloquence of Marjory Stoneman Douglas students like Emma González and David Hogg, both of whom spoke during the Washington, D.C. march. Indeed, these accounts are certainly true. But, as a recent article in Slate titled "They Were Trained for This Moment" points out, in terms of innate talents and ability, these youth aren’t prodigies. Rather, they attended a high school where extracurricular programs like debate, theater, and civics are part of the curriculum. Indeed, the students humbly admitted that they are privileged. They have the voice and ability to stand up in a way that grade school students in Newtown didn’t, or that young people from neighborhoods regularly suffering violence, like some in Southeast D.C., can’t. In other words, they were provided the opportunity to tap into their innate agency. Of course, not all young people around the world benefit from similar opportunities. Youth living in poverty or in otherwise vulnerable communities often lack even the barest resources needed to thrive. And this is where positive youth development agencies play a critical enabling role. Unfortunately, the Marjory Stoneman Douglas shooting is not the first of its kind—far from it—and many young people face violence in their schools and neighborhoods around the country every day. 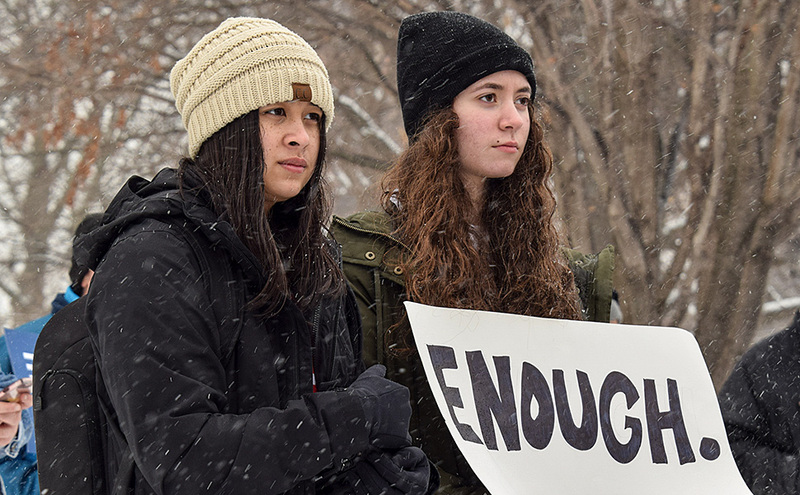 The call for tougher gun legislation in the aftermath of a school shooting is not new, either. What’s unique, though, is the youth-led, youth-driven nature of the movement that has arisen. Young activists have emerged, deciding along with their families and supporters that if anything is to be accomplished, they must take the lead. What the outcome of their efforts will be remains to be seen, but so far people are listening as these young women and men declare loud and clear what they want, what they need. We should all pay close attention to what they are saying, and rather than seeing them as victims in need of saving, we should view them for what they are—allies with insights to contribute, ideas to share, and the ability to get things done. As I left the march of Saturday and later watched a documentary on the integration of public schools in the 1960s, I knew we were at a moment of fundamental change in the United States. And, once again, young people and their voice are leading the way. Susan Reichle is IYF's President & COO.